(SAVANNAH, Ga.) — Today I jumped into the Atlantic Ocean along with 100 costumed Georgians. I loved it. That’s the Polar Bear Plunge for you, which happens every year on Tybee Island. Though it hurt to be thrashing in icy water alongside half-naked strangers, it was also beautiful. The temperature was shocking, but we were all in it together, figuratively and actually. I knew hardly anyone there — not the people painted as Smurfs nor the band of Oompa-Loompas nor the various, inevitable cross-dressed men — but I felt I shared something with them. It was just something goofy, something flecked with pleasure and pain, but that is good enough for me. I savor that kind of camaraderie no matter how it comes my way. It’s six hours later now, and it’s silent where I’m parked, even though I’m not far from downtown Savannah. I am immensely digging the quiet and the dark. As I travel, I am constantly fighting sensory overload. Distraction and new things are everywhere. I thought it was great being in Times Square and standing at the CN Tower in Toronto and seeing the nightlife of Wilmington, N.C. But I also really enjoy solitary nights in my trailer, when I’m free to bake or read a book or perhaps knit while watching a movie I’ve seen before. Sometimes, I fear there’s an old lady lurking inside me. I can’t help how much I like the simple life. 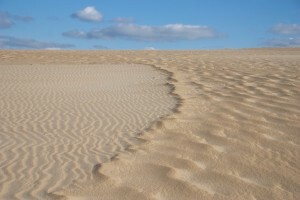 Jockey's Ridge State Park. 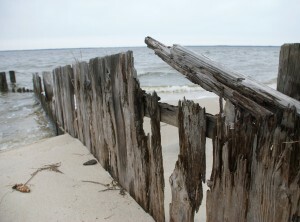 Nags Head, N.C. I know that is why I loved the Outer Banks. I want to apologize to those islands, as I feel I should have written more about them when I was actually there. Yet, while I was staying in Nags Head and Ocracoke, it was so natural and nice that I almost felt I didn’t have to document it. It seemed that much a part of me. There, I felt like there was room for me. Like so many beach communities on the Atlantic, the towns that dot the skinny island slices of the Outer Banks are extremely seasonal. These places are crawling with people in the summer, but in the winter months, no one is hardly home. I was free to explore the dunes and run on the beach and walk through the empty residential zones without encountering anybody. It’s not that I like to be alone all the time. I swear it isn’t. I love being around people who welcome me — but I also need the feeling of discovering on my own. 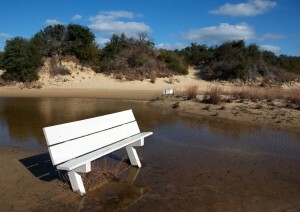 In Nags Head, where I first stayed, I took a lonesome dune hike at Jockey’s Ridge State Park and couldn’t get enough. The dunes were untouched and golden, and the sky was so big and open and bright blue. Like a kid, I pretended I was lost in some desert-filled country (one that just happens to always have a view of mini golf courses and pirate themed restaurants on the horizon). That freedom to be silly made me buoyant. Another day, I checked out the Wright brothers’ monument and historical site and got my dose of inspirational history for the year. I felt gleeful getting to experience all that solo. 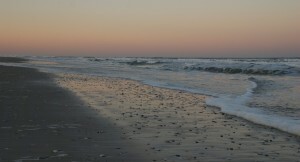 An evening by Corolla, N.C., the upper tip of the Outer Banks. I had no love for the commercial side of the Outer Banks, from the ubiquitous souvenir shops to the over-priced seafood buffets. Luckily, loving coporate glitz isn’t an OBX requirement. Being there at such an empty time allowed me to have my own experience, away from the neon strip mall quality of the place. And when I did hang around people, it felt, to my surprise, like I had known them for a long while. Enter Laura and Chris, a brother and sister who invited me to park outside their home in Nags Head for several days. I met Laura through Couchsurfing.com (something that is definitely, completely worth you checking you). I liked her immediately. And we become friends about that fast. Whenever that instant connection happens, it’s strange and rare, and it never fails to shock me. I think it surprised Laura too, but I also got the sense that she creates that wherever she goes. 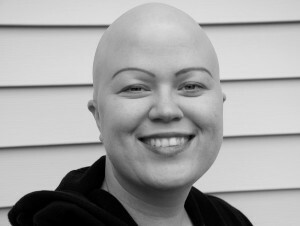 She’s a friendly, gregarious lesbian chick who is bald and has no eyebrows due to a medical condition. She also grew up as a Jehovah’s Witness for the first part of her life, so yeah, she knows a little bit about being different. And she plays it off with style and honesty and not a hint of anger. She and her brother always live together and move a lot, and I got the sense that wherever they go, she becomes a minor celebrity. 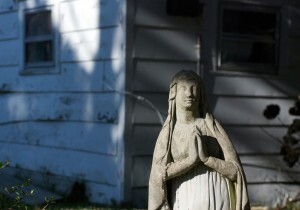 I was floored by this and kept wanting, but not really asking for, her secret. How does one become so damn dynamic? The 1998 middle school version of me was dying to know and still is. Chris and Laura and my trailer. Her brother was also a nice, sweet person, and it was hard to leave them both. But like always, I had to keep going. The day I said goodbye to Nags Head the weather was crazy, with rain and storm surges flooding the road that runs north-south on the island. It was only open for a brief time, and I squeezed through that window, though I probably shouldn’t have. I have never experienced anything quite like that drive. I grew up in Northern California, where there are typically cliffs or winding trails separating you from the ocean. But that just isn’t so in the Outer Banks. 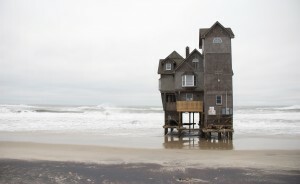 The only things that weren’t at sea level were the houses on stilts, and even those looked hilariously vulnerable against the power of the waves. 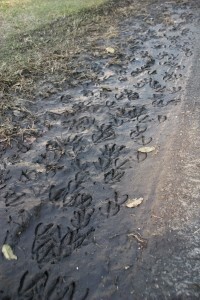 The road was terrible, doused with sand and water. Still, I doggedly dragged my trailer down it, at one point going through a 10 mile stretch that was submerged in more than a foot of displaced ocean. In Rodanthe, one of the many closed down beach towns along the way, I pulled over, got out and stood on a dune against the wind. The gusts were so powerful that they could have knocked me over, but I was invigorated. I looked down at all those stilt houses in front of me and couldn’t help but smile. For a moment, I realized what a big adventure I’m on. Then a few people drove by, including a cop, and I got self-conscious and went on my way. 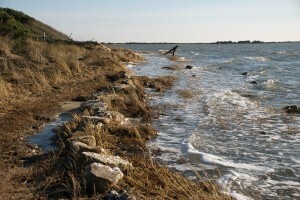 One freezing night and ferry ride later, I arrived on Ocracoke, the Outer Banks’ most remote island. I hear that in the summer it’s completely overrun with people, enough so that many locals try to make their living for the year in those short months. 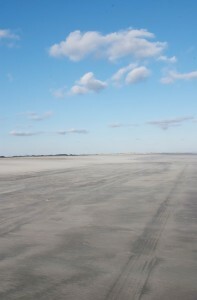 But during my stay it was thankfully, almost completely, deserted. Supposedly, I was sharing the island with 700 year-round Ocracokers, but it felt more like 30 friendly characters taking turns entering whatever scene I happened to be in (Don’t many tiny towns feel like that, really?). 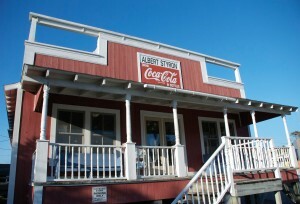 Cue the woman working in the general store, whose family has owned that place for decades. Cue that joyous couple, the one that owns Thai Moon, which sells some of the best Thai food I have ever tasted. Cue Robert, the guy who’s working like crazy to get Ocracoke’s first community radio station off the ground. I didn’t feel like one of them, but I was strangely comfortable around nearly every person I met on the island. The last one I’ll leave you with is Ingrid, the 23-year-old American Swede who invited me to stay with her for those three Ocracoke days (I’m telling you — you must check out CouchSurfing.com). She’s the person I spent the most time around on the island, and though I’m sure she doesn’t know it, she inspired me. 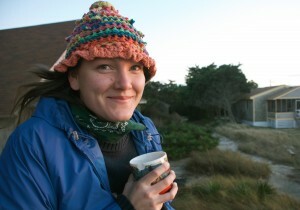 She grew up mainly in Sweden but also partially in Ocracoke, and this gave her a comfort with it of which I was almost jealous. She showed me around, pointing out old houses and telling me stories about how the families who founded the town still have descendants there. We went on walks and explored the beaches and the cemeteries. I showed her how to knit. We watched movies. This wasn’t dramatically exciting stuff, but it was great. Probably the lack of drama was what made it so. 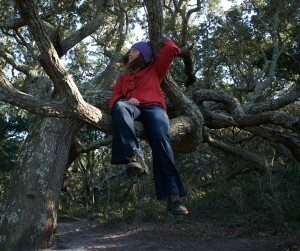 Climbing trees with Ingrid, my Ocracoke buddy. Ingrid was upfront about the fact that she doesn’t know what she is doing with her life, and I took that as a great comfort. It’s nice to be reminded how OK that is. Soon, she’ll leave on a bike ride across America with a few of her friends, but after that, who knows? Maybe she’ll go back to school. Maybe she’ll live for a while in San Diego, where her trip will end. All she was sure of is that she wants to travel. God, I understand that. It’s what to do next that can feel so daunting. I wish Ingrid the best of luck answering that question for herself in 2010. And I, perhaps selfishly, wish myself luck too. I don’t know how you commit to one spot in the world after being so fluid and traveling for so many months. How do you choose — or does it choose you? I have a sense this is something I’ll have to learn this year. I’m already a bit sad about it. But secretly, I am kind of excited, too. 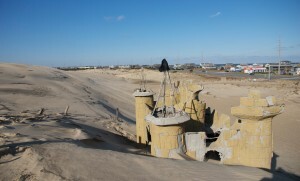 A sand castle — that just happened to be made of chicken wire and plaster. 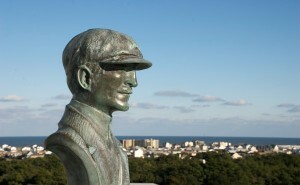 Nags Head, N.C.
Orville Wright, in the spot where he and his brother first flew. Kill Devil Hills, N.C. 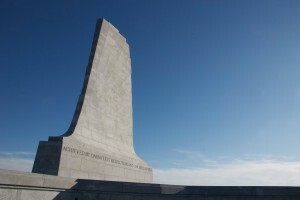 The Wright brothers' monument. 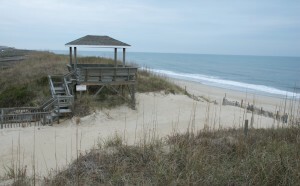 Kill Devil Hills, N.C.
Out by the "lost" colony of Roanoke, near Manteo, N.C.
Little house on the sea. Rodanthe, N.C.
A view from the ferry to Ocracoke from Hatteras, N.C.
What I found on a walk with Ingrid. 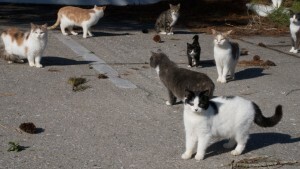 Ocracoke, N.C.
Feral cats of Ocracoke unite. No quid were harmed during the making of this picture. 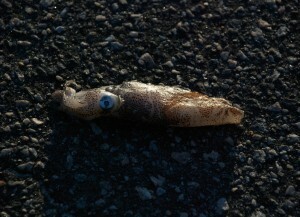 I found this little, unfortunate guy on the street in Ocracoke, N.C.
During high tide, this beach is completely submerged. The fellow who started Ocracoke's community radio station was nice enough to take me out to see it. Thanks again, Robert. 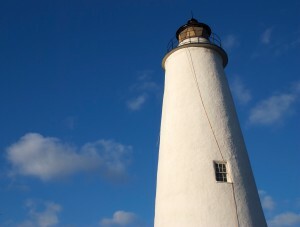 Ocracoke's lighthouse. Yes, that's an extension cord. Abner the chihuahua and historic Howard Street. 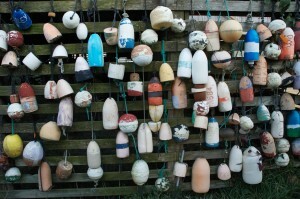 Ocracoke, N.C.
Great post. Thanks for sharing your experiences. 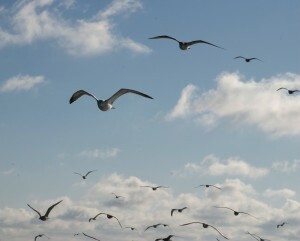 It seems like you got a great feeling for what the Outer Banks is all about. We hope you’ll be back soon. 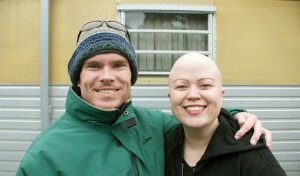 I just found your blog and love the fact you were part of the polar bear swim on New Year’s Day! 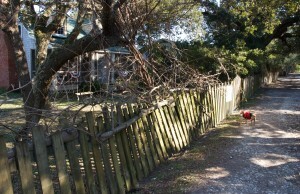 I’m also very glad Tybee Island was part of your travel experience. I agree about the OBX- so much is commerical that when you can find part that is truly what they’re all about, its a bit of magic. 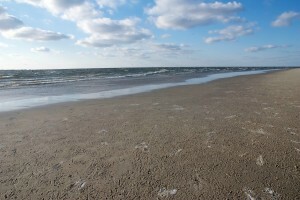 Hope you’ll come back to Tybee again soon!